With the high demand for quick and convenient meals that taste great, it is no wonder that the tortilla was transformed into an all-purpose wrapper. Sandwich wraps have invaded our lives and are popping up throughout the spectrum of food service establishments from grocery stores to gourmet bistros to your local fast food joints. Some of you may be wondering what a wrap is. A sandwich wrap is typically a bread wrapper with vegetables, meat or beans and legumes, rice or grains and a spread that acts as a binder. All of these ingredients are rolled up in the bread wrapper and voila – you have an easy and delicious snack, lunch or even dinner entrée. Wraps are more than just tortillas. Wraps can be flavored tortillas (like spinach, tomato and garlic herb), naan, wonton skins, leaf and vegetable wrappers, pita breads, lahvosh also known as lavash (a Middle East flat bread) and more! Spreads can be a variety of delicious delights like low fat hummus (my favorite), baba ganoush (an eggplant spread), low fat cream cheese, flavored cream cheeses, salsas of all shapes and sizes and sun dried tomato or pesto spreads. The fillers of wraps can range from the very simple peanut butter and jelly wrap to a spicy Thai shrimp curry wrap. Vegetable fillings may include cucumbers, avocados, red onions, scallions, cilantro, parsley, mild or hot chilis, roasted vegetables, artichoke hearts, shredded carrots, bell peppers, zucchini, roasted corn, portabello mushrooms and the list goes on. Many wraps contain some greenery like mesclun, arugula or romaine lettuce leaves and shredded cabbage. The “meat” of wraps can be lean cold cuts like turkey and chicken, tuna, shrimp, black beans or other beans, rice and grains or tofu. Though wraps may seem healthy … buyer beware. Some of the wraps you find can be very high in fat. Salad dressings, spreads, high fat cheeses and meats can result in a very high fat wrap. On the flipside, choosing low fat and flavorful sandwich spreads, plenty of vegetables and leans meats, cheese and even beans and legumes can result in a fabulous nutritional masterpiece. 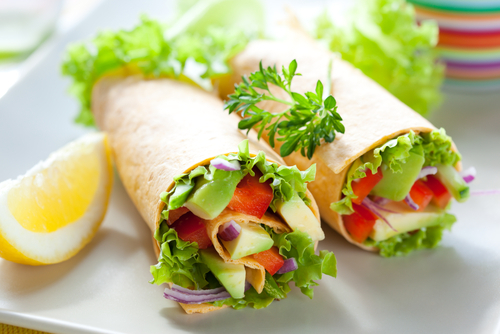 Wraps are a great way to rev up the ol’ boring brown bag lunch for adults and children alike. Wraps are versatile, adaptable and can be packed with good nutrition. So pick up your wrap and roll away! With a smaller shell or wrapper the best way to wrap is by simply rolling up into a long cylinder shape. For larger wraps you can fold in the sides slightly and roll up for a “burrito type” wrap. A typical roll consists of placing your wrapper on a flat surface and adding a spread or “binder” (kids like “food glue”). Next you would add your flat liners like lettuce or roasted peppers and the remainder of your ingredients on one end of the wrapper. You would then begin rolling up while continuing to pull back on ingredients to keep the wrap tight. You can secure it with a toothpick and/or seal the wrap with plastic or foil and refrigerate. * If your tortillas begin to crack when working with them, heat them briefly to soften them. * Our family relies on wraps for healthy quick super snacks between school and sports as they are perfectly portable. * Overfilling your wrap will make it more difficult to fold and roll. * Use flat foods to line your wraps like lean cold cuts, jarred roasted peppers, flat leaf spinach or Romaine lettuce. * When ordering wraps at a restaurant, which tend to be gigantic in portion size, share one half with a friend or family member or ask the wait staff to split one and wrap half of it to take home. * Look for low fat or fat free tortillas. Flour tortillas tend to be higher in fat than corn tortillas. There are some great whole grain ones on the market now as well. * Try nuts for flavor and texture in vegetarian wraps. * Kids love to help in the kitchen and wraps are an easy way to engage their assistance. It might even help them try some new foods and flavor combinations.